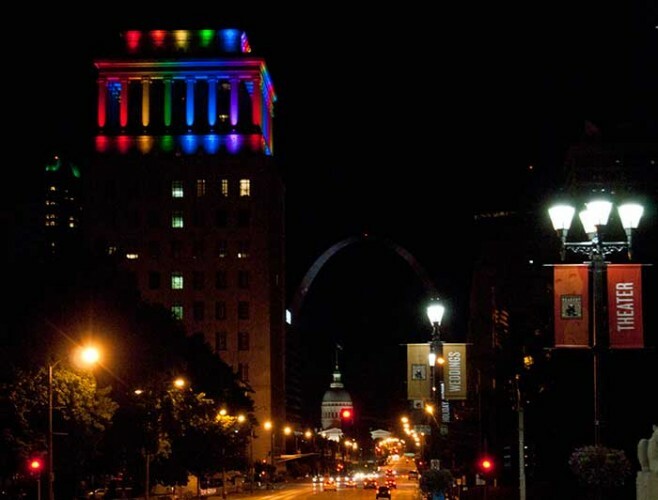 Chauvet Professional COLORado fixtures colored a dramatic rainbow on the Civil Courts Building for a PrideFest initiative in downtown Saint Louis. Ironman Sound Industries production company of Brentwood, Mo., specified 36 COLORado 4 IP wash battens and 24 COLORado 1 Tour PAR-style wash fixtures, which uplit in saturated colors the top of the Civil Courts edifice. “We used 36 COLORado 4 IP luminaires to light up the outward face of each of the columns that wrap the building,” said Stace Napper with Ironman Sound Industries. COLORado 4 IP is an outdoor rated, linear wash light that features four powerful 40-watt quad-colored RGBW LEDs. The incorporation of white LEDs widens the color palette, while 15-degree lenses produce a powerful punch of homogenized color. 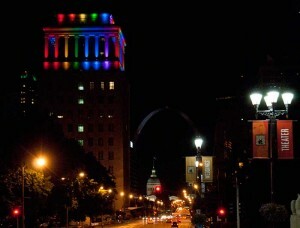 Individual pixel programming enhances the visual impact of this versatile and resilient fixture. A removable yoke doubles as a mounting bracket for stacking an array of up to four units that maintain a perfect pixel pitch.